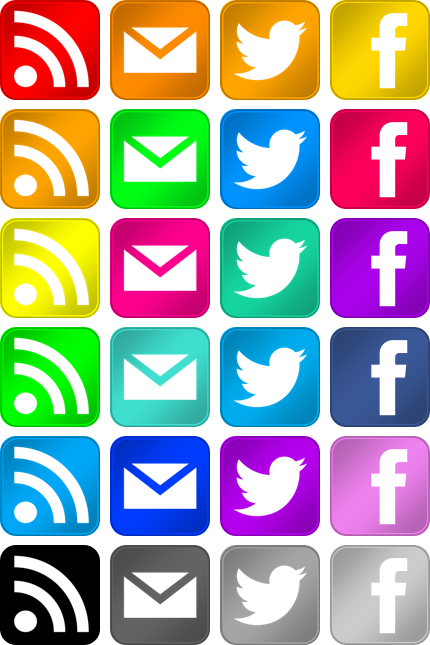 The most common ways for people to subscribe to a blog and its content are through RSS, Email and Twitter. Facebook pages are increasing in usage too. 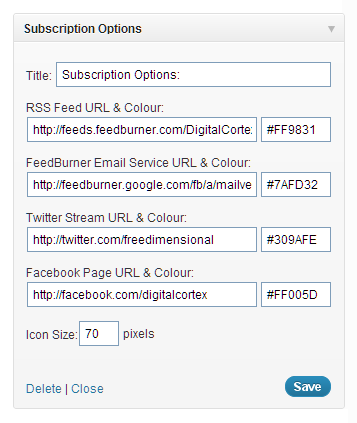 This plugin places the above icons in a widget area and lets users enter their own feed or page URLs and colour options. It’s really simple but there’s lots of power under the hood. Offers an attractive range of subscription options for your readers using familiar-looking icons. Intuitive interface for editing options, including your feed/page URLs, widget title and icon sizes. Ability to select any colour, via HEX code or HTML Color Name. Extract the files and place the entire ‘subscription-options’ folder in your wp_content/plugins directory. Go to your ‘Installed Plugins’ panel and activate ‘Subscription Options’. – Please note that you don’t need to use all the icons – just don’t enter a URL if you don’t want an icon to show up. If you would like additional icons for LinkedIn, Flickr, Google+, Podcasting, YouTube, Pinterest, Spotify or Tumblr, please consider installing the Subscription Options Add-on Pack and a new set of subscription options will automatically appear in the widget options panel. You can place it wherever you like as long as it is within a pre-defined widget area. I haven’t worked out how to let people place the widget wherever they like. Let me know if you can help on my contact page though. Why have my icons turned grey and colourless? You’ll need to re-enter your colours, as the widget now uses a different way to pick them. You can pick any HTML colour, be it via HEX code or HTML Color Name. Just enter your preference and hit ‘Save’ in the widget settings. The latest version of this plugin gives you thousands of new colour options, using transparent icons and CSS3 rounded corners. As such, the widget looks best in modern CSS3-compatible web browsers such as Firefox, Google Chrome or IE9. If you are not entirely comfortable with this, you can always roll back to an older version. How do I find my Feedburner Email Service URL? The clickstream from within Feedburner looks like this: Publicize > Email Subscriptions > Activate. Then right click and copy the text that says ‘Preview Subscription Link…’ That’s your Feedburner Email Service URL. Thank you so much for asking. There are a couple of options. You can purchase the Subscription Options Add-on Pack and receive eight new icons, or you can click the donate button below to contribute any sum to the developer, without downloading the add-on pack.